Launched as a frivolous way to raise awareness and funds for The ALS Association, everyone from Bill Gates to David Beckham has completed the Ice Bucket Challenge – and nominated famous friends to take a drenching too. 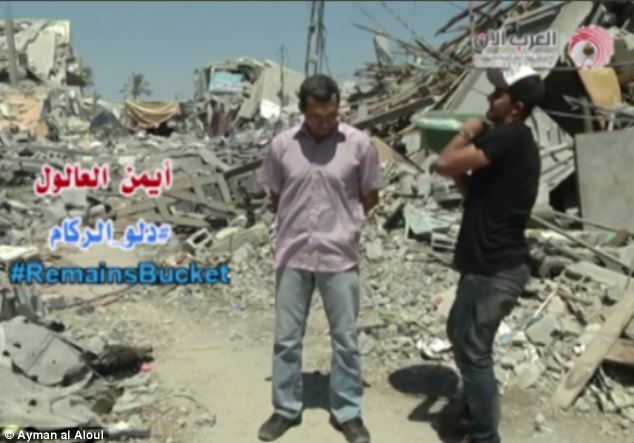 Now residents of Gaza have launched their own version of the internet craze in order to raise awareness of the desperate conditions facing many living in the conflict-stricken territory. 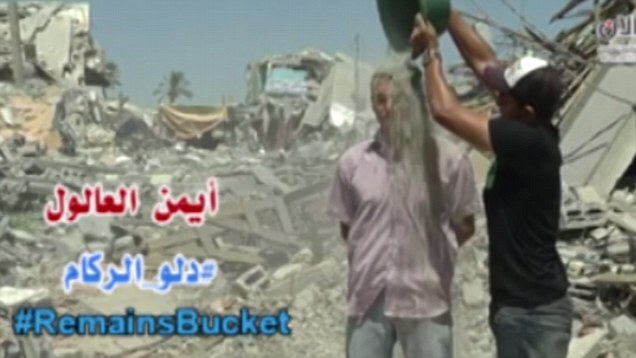 But rather than tip buckets of water – a precious resource in the Gaza Strip – participants are filmed tipping rubble out of a bucket over their heads. 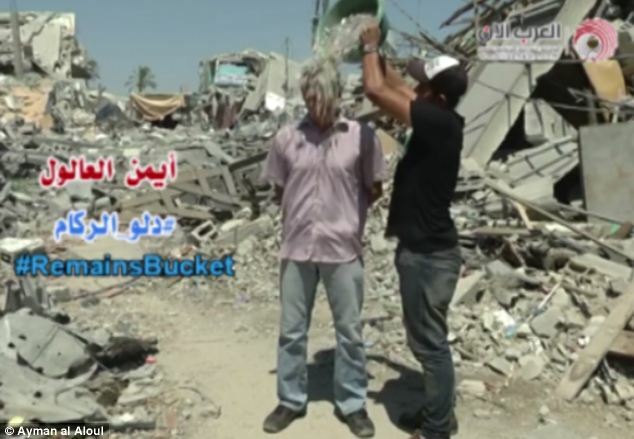 In the video, filmed on a Gaza street destroyed by bombs, Aloul said that he liked the idea of the Ice Bucket Challenge, but that he couldn’t justify using water. He said: ‘The use of water is more important than to empty over our heads. And even if the water is available it is difficult to freeze it. He explained that he instead decided to use rubble taken from the remains of buildings. The inaugural Rubble Bucket Challenge video uploaded to the group’s Facebook page on Saturday. By Monday morning, nearly 2,000 people had liked the page. The Ice Bucket Challenge – which asks every person taking part to make a donation to a charitable cause – has raised nearly £40million for the ALS Association, which works to fight the neurological disorder also known as Lou Gehrig’s Disease. Macmillian Cancer Support has adopted the fundraising idea in the UK. But Aloul’s aims are more modest. He said that, rather than ‘material aid’, he wanted people to offer their ‘solidarity and support’ for the people of Gaza. He said that, while he could see the benefit in having high-profile people take part in his challenge, he wanted it to be seen as something for all people to take part in. He said: ‘It is not for specific people but for all people who sympathize with the Palestinian people. 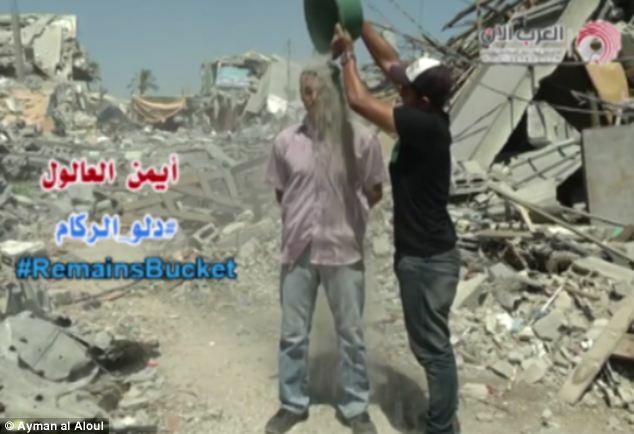 The challenge has taken off on Facebook and social network Twitter, where users have shown their support by posting videos along with the tags #RemainsBucketChallenge #rubblebucketchallenge and #dustbucketchallenge. Aloul’s video comes as it emerged that hundreds of Palestinians desperate to escape Israel’s bombardments in Gaza have been queuing to cross into Egypt. 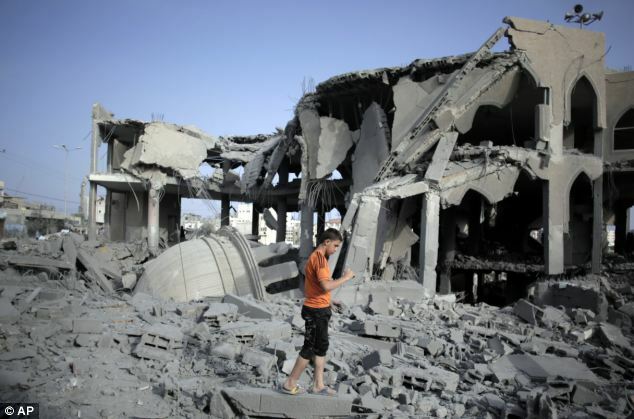 Thousands of homes in the Gaza Strip have been destroyed or damaged in the conflict and nearly 500,000 people have been displaced in the territory where Palestinians, citing Israeli attacks that have hit schools and mosques, say no place is safe. 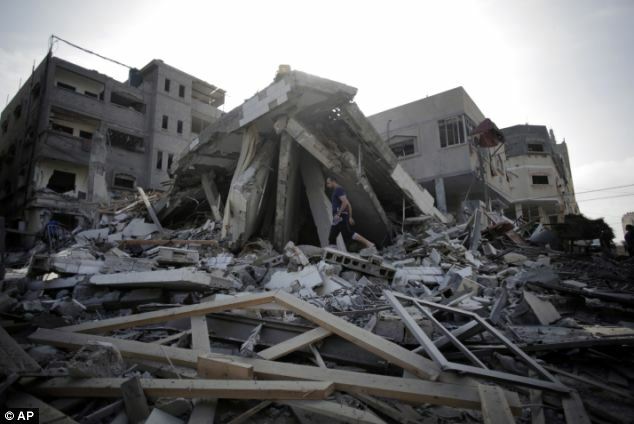 Israeli air strikes killed at least five Palestinians in the Gaza Strip and militants kept up their rocket fire on southern Israel on Monday, witnesses and officials said, as Egypt pressed on with efforts to broker a durable truce. 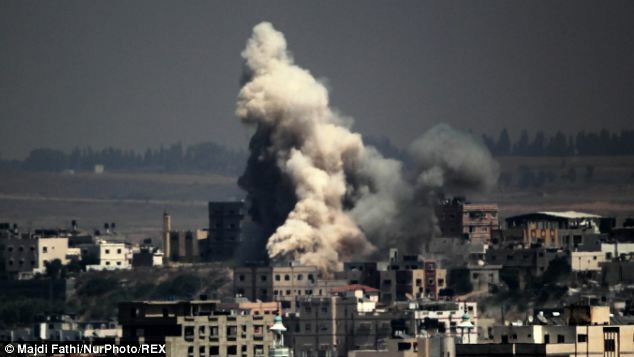 Palestinian health officials say 2,119 people, most of them civilians including more than 400 children, have been killed in Gaza since July 8, when Israel launched an offensive with the declared aim of ending rocket fire into its territory.